2.2L with automatic transmission all stock except for an aluminum radiator. This winter will be doing a 5.3 LS swap. Pioneer MP3/CD player with Pioneer speakers. Factory suspension. Soon will be doing a static drop with air shocks. 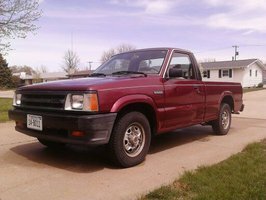 Added my 1993 Mazda B Series Truck!